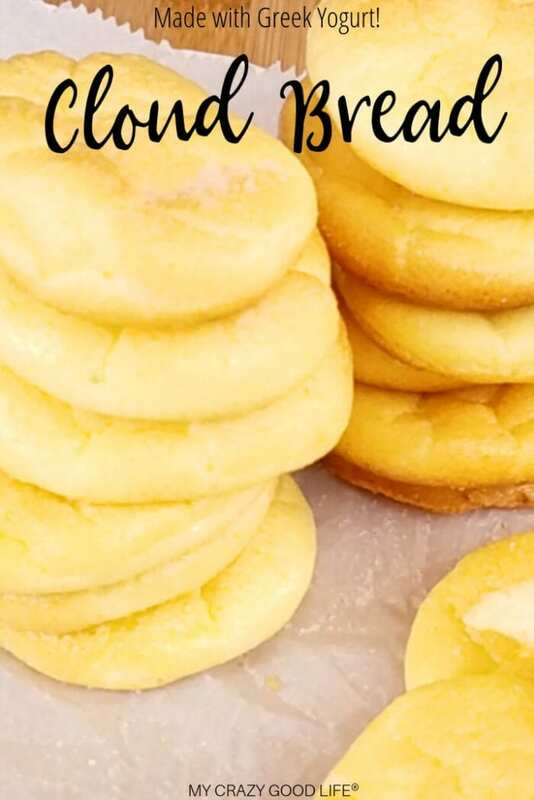 Cloud bread is a staple around my house–it’s perfect to snack on and doesn’t count as a carb–I’m in! This Low Carb Cloud Bread with Greek Yogurt is a cleaner version of the traditional cloud bread recipe (that is usually made with cream cheese). Whether you’re on a low carb diet, or maybe the 21 Day Fix, this bread is a life saver. It’s soft and fluffy, tastes delicious with a sprinkle of salt on it, and I could literally eat an entire batch in one day. Is Cloud Bread hard to make? 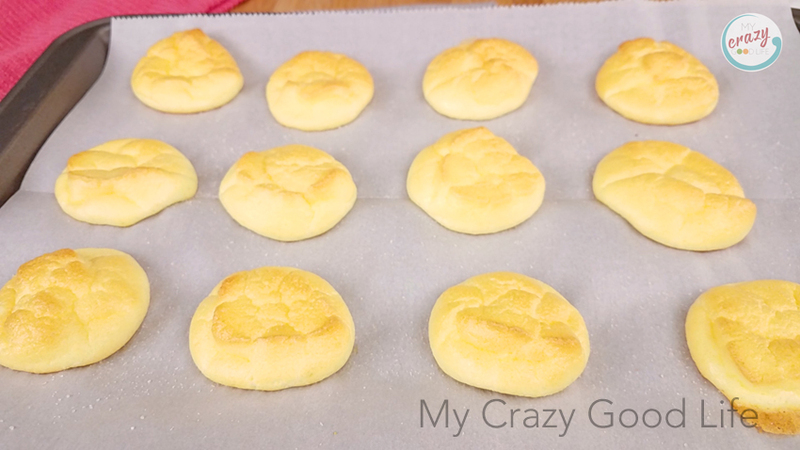 Cloud bread isn’t the easiest recipe, but I’ve given you a ton of tips in the recipe below to help you. It might take a few times to get it right, but trust me–it’s delicious when you do! This isn’t a recipe to experiment with–swapping main ingredients isn’t recommended, but you can easily add your favorite spices to the top as soon as they come out of the oven. 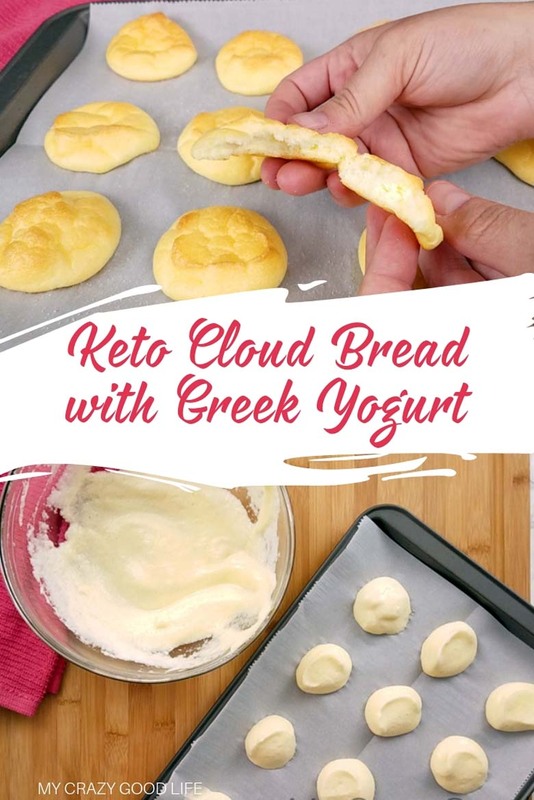 Does this low carb Cloud Bread with Greek Yogurt taste different than Cloud Bread with Cream Cheese? I don’t think so! I like cloud bread with Greek yogurt just as much. It’s still light and airy, and still a delicious healthy snack–maybe even healthier. How many piece of cloud bread does this recipe make? I can make 15-16 pieces if I make them on the smaller side like in these pictures. You can make larger pieces of cloud bread and use it for pizzas or sandwiches if you like, but you’ll end up with less of them. How many calories are in Cloud Bread? There are 54 calories in 1/4 of this recipe. 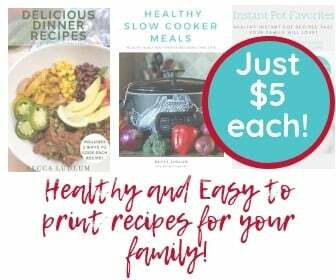 All of the nutrition information is down below in the printable recipe. How do you use Cloud bread? You can use cloud bread just like you’d use bread, except for toasting–it comes out quite dark in the toaster, I wouldn’t recommend that. Use cloud bread for dips, sandwiches, pizzas, or just for snacking. It’s light and delicious, and like I said–crazy low carb. Before you begin, preheat your oven to 300 degrees. You can use parchment paper under the cloud bread, but I prefer a silpat baking mat on top of my cookie sheet to help avoid sticking. Cloud bread likes to stick. It is important that the eggs are room temperature–not warmed in a bowl of warm water or the microwave, but true room temperature, I leave mine out for at least 3 hours on the counter. I think this helps the cloud bread batter turn out fluffy and not runny. I also pull out my Greek yogurt before, but not necessarily 3 hours before. 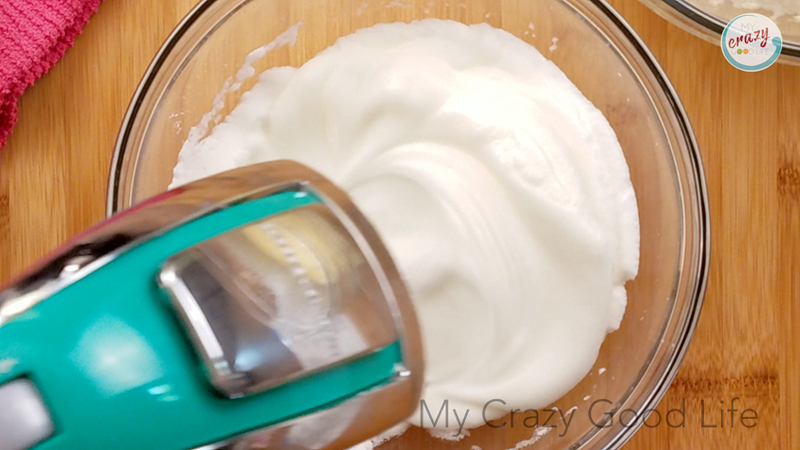 1.Mix together egg yolks (yolks only) and greek yogurt until blended smooth. I’d almost say over blend these, try to get rid of as many lumps as you can. 2. Beat egg whites and 1/4t baking powder (some have used cream of tartar instead) until fluffy. Again, I’d over blend these and make sure to get the same consistency from top to bottom of your bowl. 3. Gently fold the egg white mixture into the yolk and cream cheese mixture carefully. Be careful not to overmix, but know that these need to be fully incorporated for your cloud bread to come out fluffy and beautiful. I recommend using a large whisk of some kind to do this. 4. Using a cookie scooper, take a scoopful of batter out of the bowl and tap it a few times lightly on the counter to let the big air bubbles out before baking. Drop the batter on your silpat baking mat or parchment paper, leaving a little room in between. Towards the bottom of the batter bowl, you might see some separation, where there is yellow yolk batter separating from the white. That’s normal–usually, the last couple pieces are a little runny and don’t cook as pretty as the first few with all the egg whites. When baking, this bottom mixture will brown a little more than the other cloud bread. This is normal, I promise! 5. Bake for 25 minutes at 300 degrees, or until golden brown. 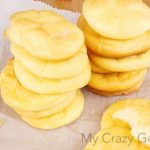 Sprinkle sea salt on the cloud bread as soon as they come out of the oven, then move the cloud bread to a cooling rack. Sprinkle anything you want on cloud bread when it comes out of the oven–italian spices, salt, garlic powder, etc. If your cloud bread comes out runny or flat, it’s because either the egg whites weren’t stiff enough or you mixed too long and flattened the egg whites. The puffy texture is all because of the egg whites. The most common issue people run into making cloud bread with Greek yogurt is that they’re flat. Like I mentioned above, it’s all about how stiff your egg whites are and how much you mix your batter. Why is my Cloud Bread flat? 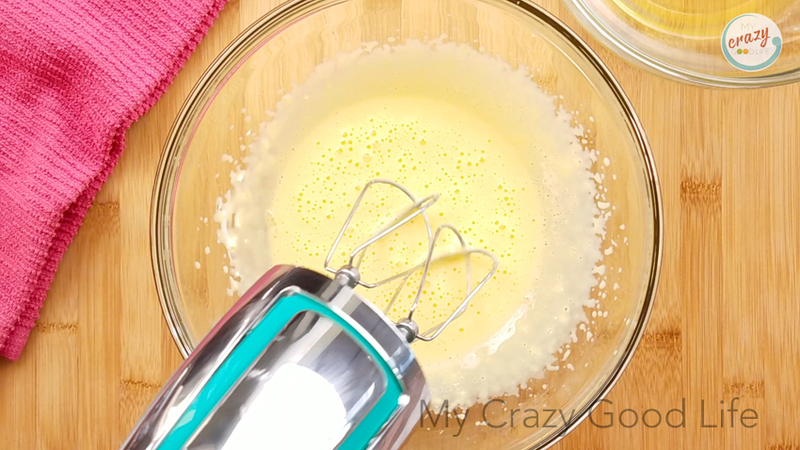 At the bottom of the batter bowl, you might have some yellow batter left without egg whites. These will make runny cloud bread pieces that aren’t super appetizing. If you have this batter, I think it’s safe to say that you can toss it. You’re welcome to put it on the baking sheet and see what happens, though! If your cloud bread turns out a little ugly, it’s probably just as delicious–don’t throw it away, try it! Can you freeze cloud bread? I have never had a batch of cloud bread last long enough to freeze–we always eat it that day. Since cloud bread is so fragile, I’d be nervous about it becoming soggy after you freeze it–but again, I have never tried to freeze cloud bread before. I have had readers say they have frozen it with good results. Is this cloud bread with Greek yogurt 21 Day Fix approved? It is! The fact that it uses Greek yogurt instead of cream cheese makes it approved. For the entire batch of cloud bread, your counts are 1 3/4 red containers. What do I serve Cloud Bread with? Make a mini sandwich with this healthy Crack Chicken recipe! This Low Carb Cloud Bread with Greek Yogurt is a cleaner version of the traditional cloud bread recipe (that is usually made with cream cheese). Cooking tips included. Before you begin, preheat your oven to 300 degrees. I use a silpat baking mat on top of my cookie sheet, but parchment paper works too. Mix together egg yolks (yolks only) and Greek yogurt until blended smooth. 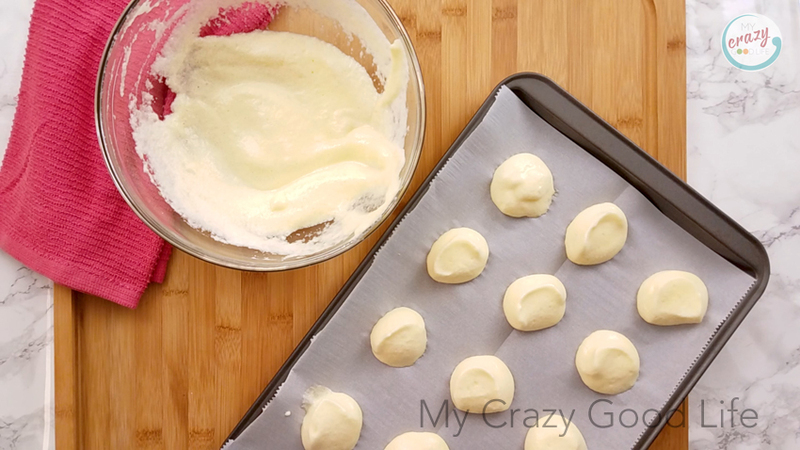 I'd almost say overblend these, try to get rid of as many cream cheese lumps as you can. Beat egg whites and ¼ teaspoon baking powder (some have used cream of tartar instead) until fluffy. Again, I'd overblend these and make sure to get the same consistency from top to bottom of your bowl. 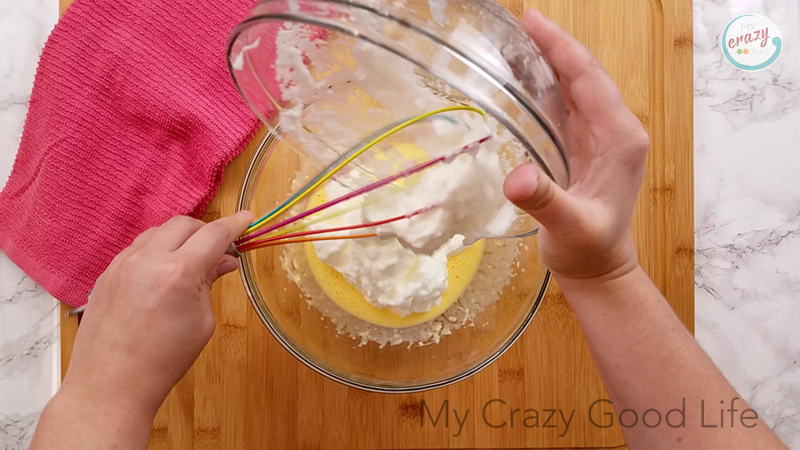 Fold the egg white mixture into the yolk and Greek yogurt mixture carefully. Be careful not to overmix, but know that these need to be fully mixed for your cloud bread to come out fluffy and beautiful. I recommend using a large whisk of some kind to do this. Using a cookie scooper, take a scoopful of batter out of the bowl and tap it a few times lightly on the counter to let the big air bubbles out before baking. Drop the batter on your silpat baking mat, leaving a little room in between. Bake for 25 minutes at 300 degrees, or until golden brown. Sprinkle sea salt on the cloud bread as soon as they come out of the oven, then move to a cooling rack. It is important that the ingredients are room temperature–not warmed in a bowl of warm water or the microwave, but true room temperature, I leave mine out for at least 3 hours on the counter. Towards the bottom of the batter bowl, you might see some separation, where there is yellow yolk batter separating from the white. When baking, this mixture will be a little runny and will brown more than the other cloud bread. This is normal, I promise!